The STR35 is a 35 watt (at 25°C) Power SMD Resistor in a TO-263 style power package. It has a molded case for protection and the resistor is electrically isolated from the attached metal tab. 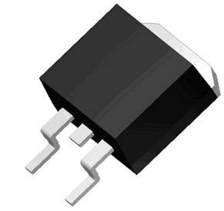 With an operating voltage of 500v max and a dielectric strength of 2000vAC, the STR35 SMD Power Resistor is ideal for use in switch mode power supplies, snubber circuits, automated controllers, RF power amplifiers and UPS applications. Resistance range from 0R50 ~ 100K ohms, tolerances of 0.5% ~ 10% and TCR ratings of 50ppm ~ 300ppm.